Once again Penn’s Village happily teams up with Friends in the City and Temple University Press to introduce Philadelphia authors who bring unique insight into our history and culture. Octavius Valentine Catto was an orator who shared stages with Frederick Douglass, a second baseman on Philadelphia’s best black baseball team, a teacher at the city’s finest black school and an activist who fought in the state capital and on the streets for equal rights.With his racially-charged murder, the nation lost a civil rights pioneer. In Tasting Freedom, Pulitzer Prize winner Dan Biddle, and co-author Murray Dubin, (both wrote forThe Inquirer) chronicle the life of this charismatic black leader—a “free” black man whose freedom was in name only. Born in the American south, where slavery permeated everyday life, he moved north where he joined the fight to be truly free to vote, go to school, ride on streetcars, play baseball and even participate in July 4th celebrations. 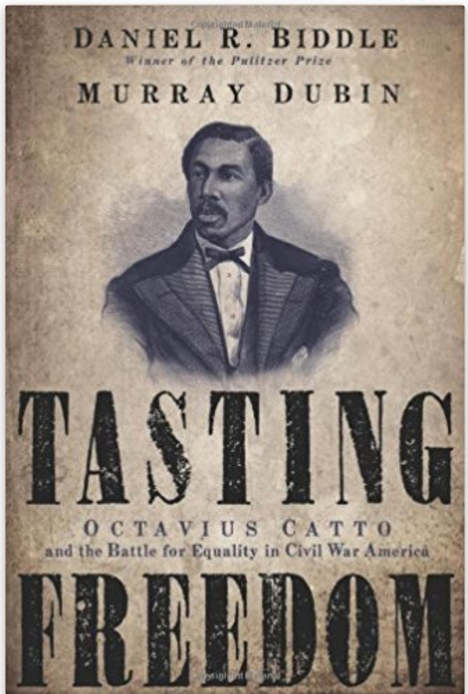 Tasting Freedom presents the little-known stories of Catto and the men and women who struggled to change America. On September 26th, a permanent sculpture of Catto was unveiled at Market and South Broad streets. We will meet in the Philadelphia Institute Branch of the Philadelphia Free Library located at 1905 Locust Street. Please email info@pennsvillage.org or call 215 925 7333 to register. The Library is not handicapped accessible, but they are working on it! Please email info@pennsvillage.orgor call 215 925 7333 to register. Books will be available for sale and signing at the event.